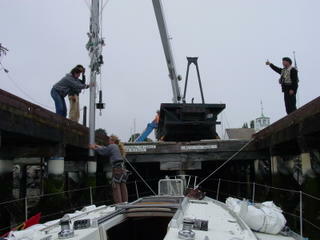 Removing the mast to replace the standing rigging, add a solent stay and install a trys'l track. I was privileged to work along side the rigging apprentice Sean throughout the project and regularly peppered the master rigger Brion Toss with endless questions. Through out the three week plus project I lived aboard La Vie in the snug Port Hudson Bay Marina located in Port Townsend, WA.